Peace Jobs for $16! IAP is Offering at 60% Discount Today and Tomorrow! Listed at $39.99, Information Age Publishing is offering at 60% discount on all purchases today (Monday, 11/26) and tomorrow (Tuesday, 11/27). This makes the price for Peace Jobs $16! 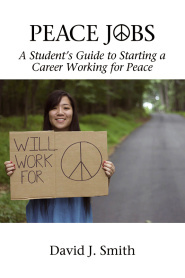 This might be a great holiday gift for your youth peacebuilder. You need to use this code when ordering from website: CYBERM18.